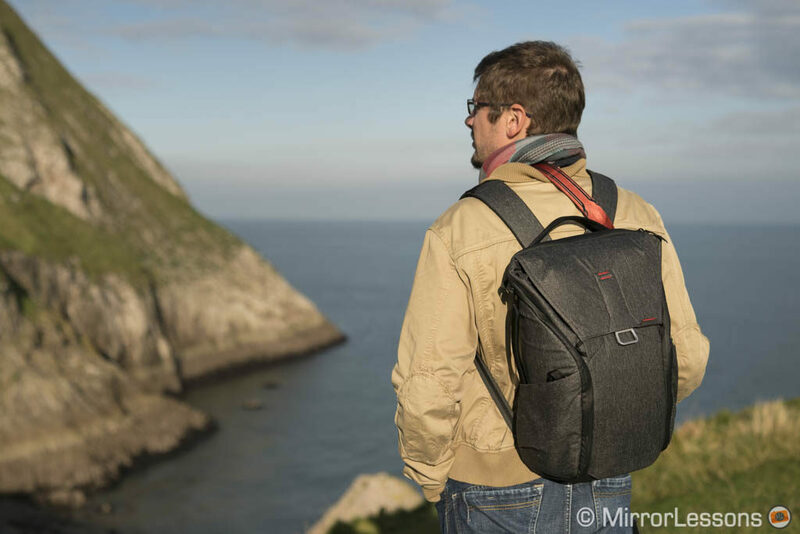 Choosing the right bag isn’t just a question of brand, model or style but also dimensions. Many products come in multiple sizes to accommodate different needs but settling on the right one isn’t always easy. 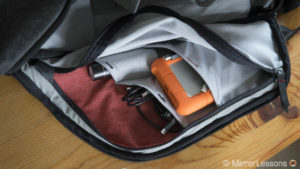 I have owned many camera bags over the years and when I look for something new, size is often a decisive factor. 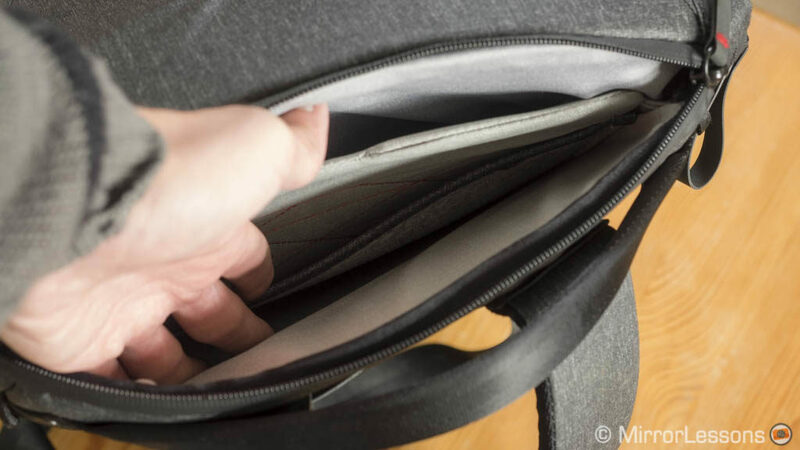 Recently I dealt with this dilemma after reviewing the Peak Design Everyday Backpack. 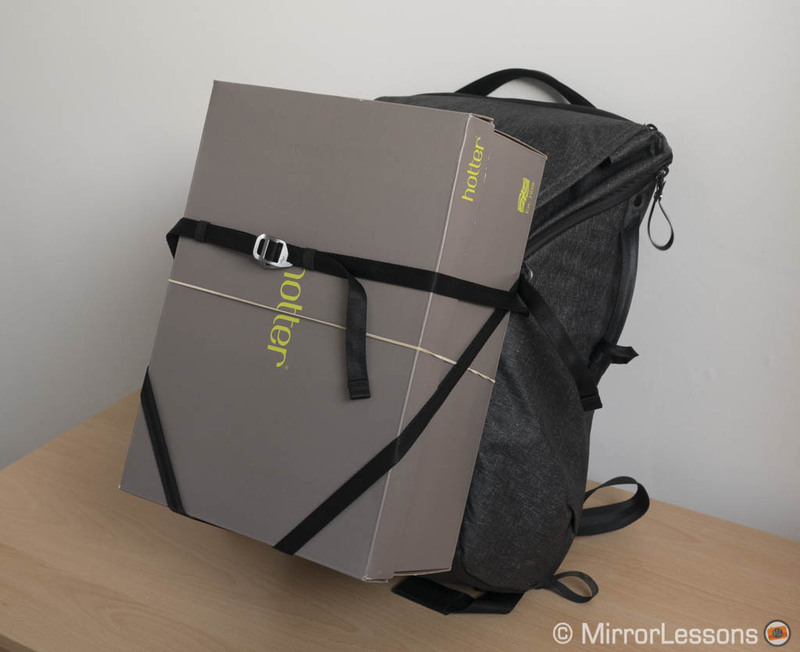 I received the smaller version (20L) first and found it perfect for my needs when carrying mirrorless equipment. However when traveling for a few days with additional personal items, I have to be really severe when selecting what to bring and what to leave home. Sure, I could use a second bag but I like to carry everything I need in one single package. So I thought: could the larger version (30L) accommodate my photography equipment while giving me that extra room I need every now and then? Let’s find out! Ethics statement: Peak Design provided us with the Everyday Backpacks for review purposes and we’ve been using them ever since. We were not asked to write anything about the bags, nor were we provided with any sort of compensation. Within the article, there are affiliate links. If you buy something after clicking the link, we will receive a small commission. To know more about our ethics, you can visit our full disclosure page. Thank you! 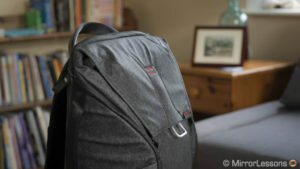 Let me start off by saying that the Everyday Backpack is the best backpack I have ever used. It has become my favourite solution for carrying cameras and personal items. My partner Heather has become very fond of it as well so having a second bag made sense. So, before digging into the practical differences between the two sizes, let me first summarise all the reasons we like it so much. 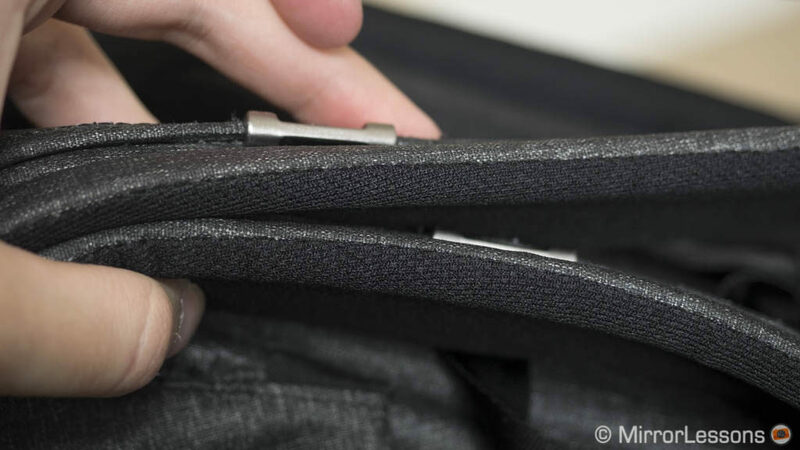 The first reason is the build quality: it is very solid, a characteristic which extends to its various zippers and hardware. Proof of its excellent design is that it can stand up by itself when fully loaded (as long as the weight is well-distributed inside). Two colours are available: charcoal (the one you see here) and ash. 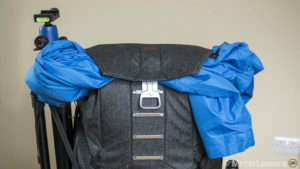 The bag is weather resistant and unlike other products, doesn’t come with a rain cover simply because you don’t need it. 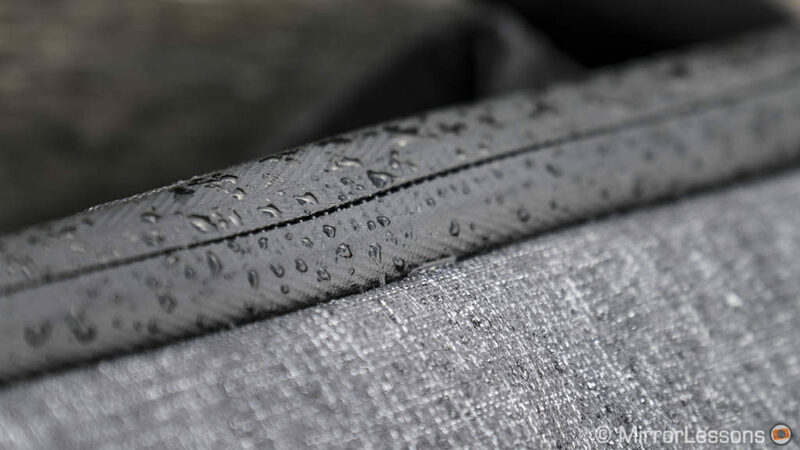 The external fabric is 100% water repellent and all the zippers are weatherproof. I’ve used the backpack in heavy rain conditions and the gear remained perfectly dry. You don’t need to worry about rain getting your gear wet. A second reason to like the backpack is the many innovative ideas that set it apart from most competitors. 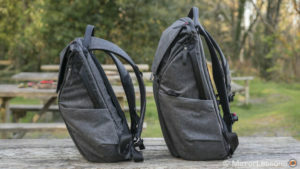 Most of these ideas were introduced on the company’s first bag, the Everyday Messenger, another product I tested and used with lots of satisfaction. We can start with the ingenious 4-step MagLatch magnet closure mechanism on top: this particular part of the bag can expand depending on how much stuff you carry inside. Even when fully packed, I rarely need to use the last latch, which always gives me leeway to add a last minute thing or to store my rain jacket for example. Because you need to pull and then lift the closure to open the bag, it is quite secure. I had my backpack inspected twice at the airport security check and both times the officer asked me to open it for him. 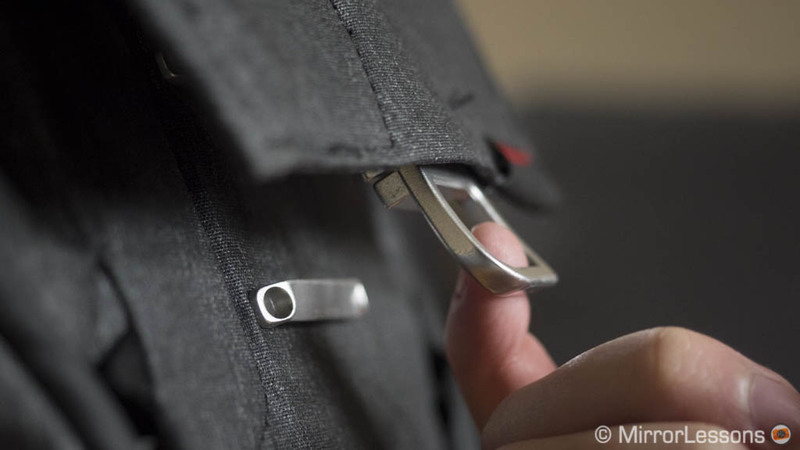 The MagLatch features a magnet for quick closure. …or expand depending on your needs. A last minute item can always find a place even if the bag is already full. The other great aspect of the Everyday Backpack is the Flex Fold divider (three are provided). You can bend it in various ways to create one, two or three compartments depending on how much equipment you’re carrying. 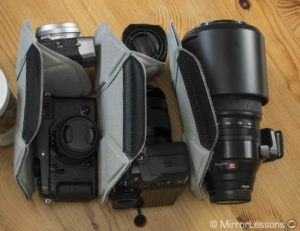 The clever thing about this system is that you don’t need to constantly move or replace the dividers, unlike traditional photo bags with traditional velcro dividers (which, let’s face it, are always a pain). Once the Flex Fold dividers are in place, you just fold them according to your needs to place the items or retrieve them. The third reason concerns the various ways you can insert or remove your camera and lenses. I already mentioned the top compartment but the two side openings are even more interesting. 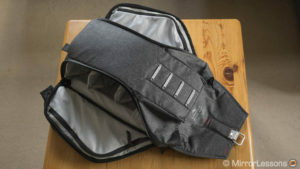 Thanks to the quick shoulder strap length adjustment, you can extend one of the straps momentarily, rotate the bag on its side, open it, take out what you need, close the zipper, and re-adjust the shoulder strap to the right length. It all works in a matter of seconds and you don’t need to put your backpack on the ground. …open it from the side and take your gear out. Finally we come to the small details. There are three handles in different positions to carry it by hand. We have the different pockets inside and outside to place many types of accessories (cables, hard drives, bottle etc). 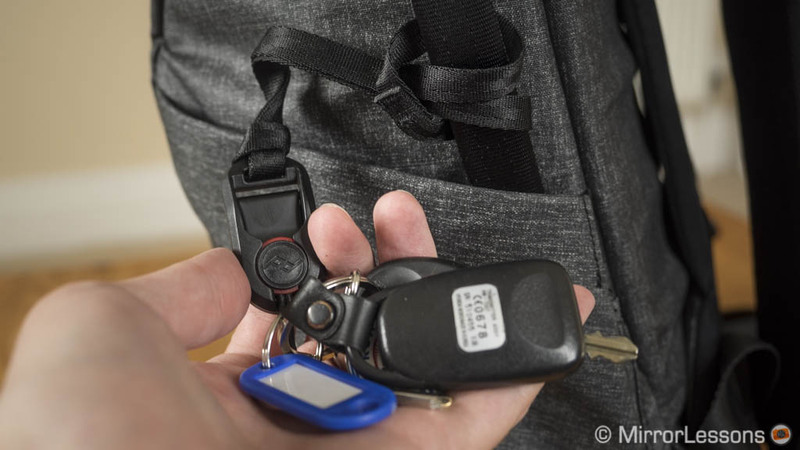 The hidden external straps allow you to carry additional gear on the outside like a tripod, a box and even your house keys which attach to the bag via an anchor link. 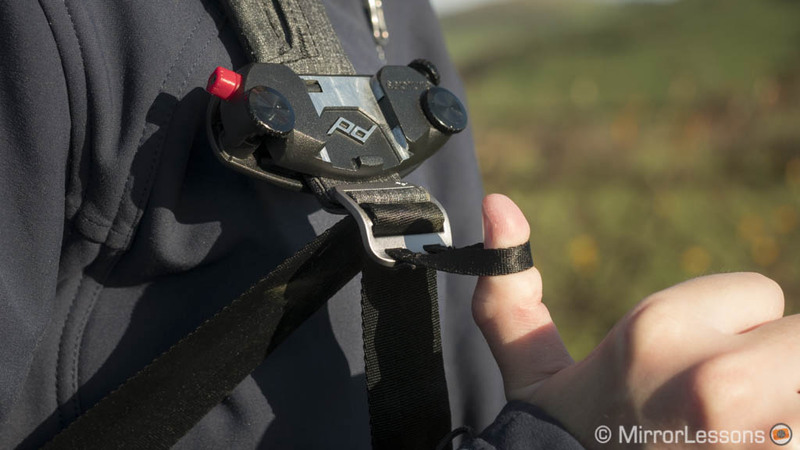 You get a sternum and waist strap for additional comfort and the backpack is compatible with other Peak Design products such as the Capture Pro clip. The X-T2 attached via the Capture Pro clip. One of the two external pockets. One of the two internal side compartments. 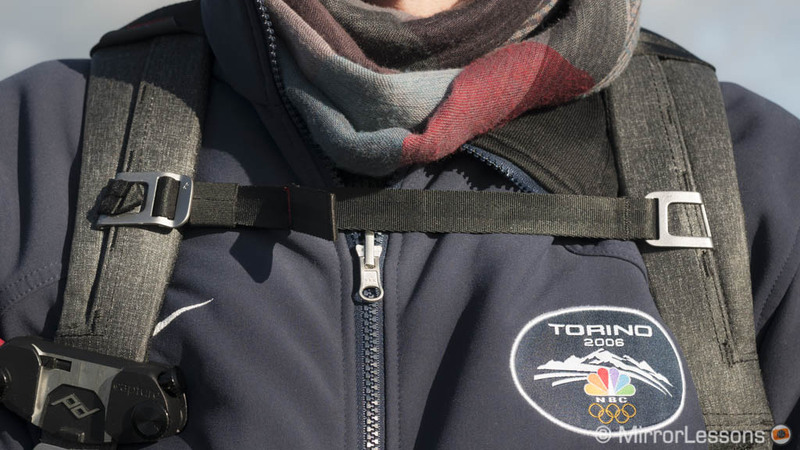 Key tether with the anchor link. A lock mechanism to secure the zipper. Additional straps to carry something bigger. Is it everything perfect then? Well, mostly, but to be fair there are few minor things that could be better. 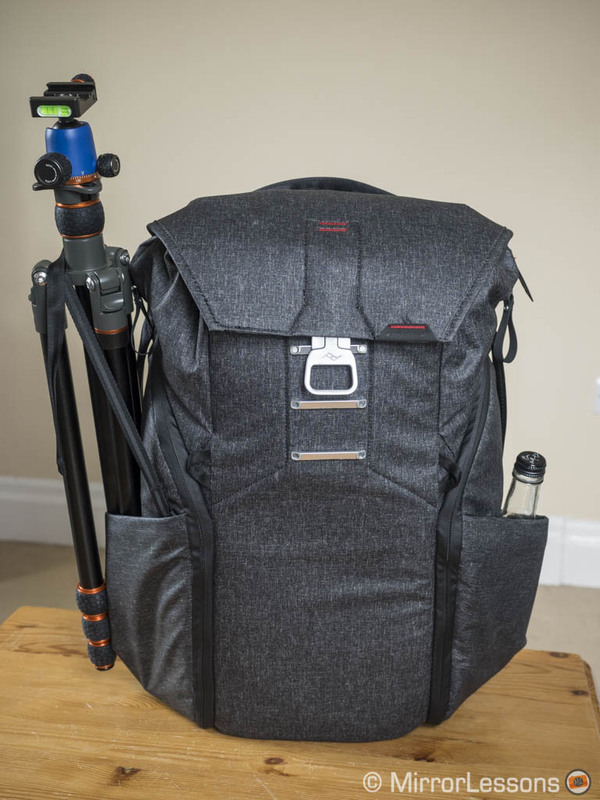 For example some of the extra straps are located inside the external pockets where we often carry things like a bottle of water or a tripod. In this case, pulling the straps out can be more uncomfortable. 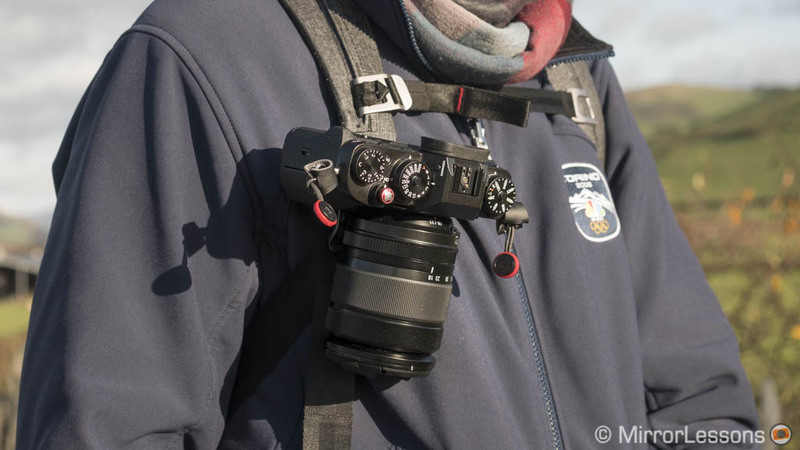 Attaching the Capture Pro clip to one of the shoulder straps is an excellent idea if you want to have your camera at the ready but I wish the straps had been designed with a specific spot to accommodate it. It is hard to attach because of the thickness and hardness of the strap itself. Everyday Backpack: 20L or 30L? Let’s start by saying that both versions are carry-on approved by major airlines and can fit underneath an airplane seat. 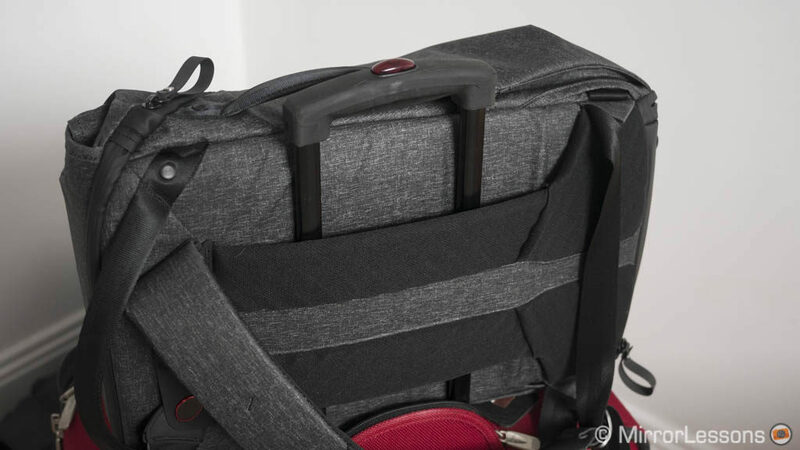 You will also find a sleeve on the back to insert the bag onto a rolling suitcase. One of the first characteristics I look at when I am undecided is the laptop compartment. I have a 15-inch MacBook Pro so I have to make sure it fits inside the bag. 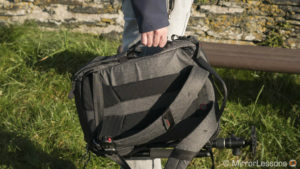 Most common bags have a 13” or 15” pocket so your choice will partly depend on the size of your portable computer. 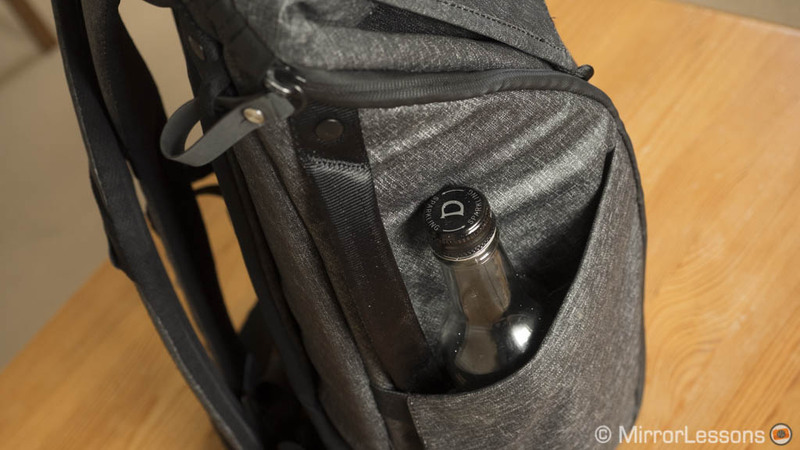 However, in this case, the 20L has a 15” compartment while the 30L has a 16” compartment which can make the decision-making process a bit more tricky. The laptop/tablet compartment on the 20L can be a little tight. Personally, I find the 30L more comfortable with my 15” Mac because when the backpack is fully loaded, the laptop compartment of the 20L becomes really tight: getting your computer in and out is more uncomfortable. With the 30L I have more leeway and this matters if you want to bring a tablet with you. The only small annoyance about the 30L is that the laptop can move further to the bottom so at times you have to “dig” it out. Now let’s move on to the actual dimensions. 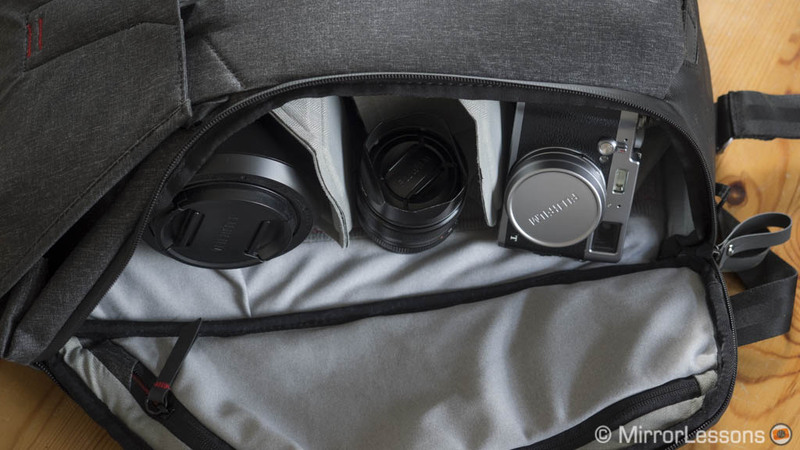 As you can see from the images below, the 30L is larger especially when seen from the front. If we read the specifications, the 30L is 200g heavier, 5cm taller, 3cm wider and 3cm deeper. 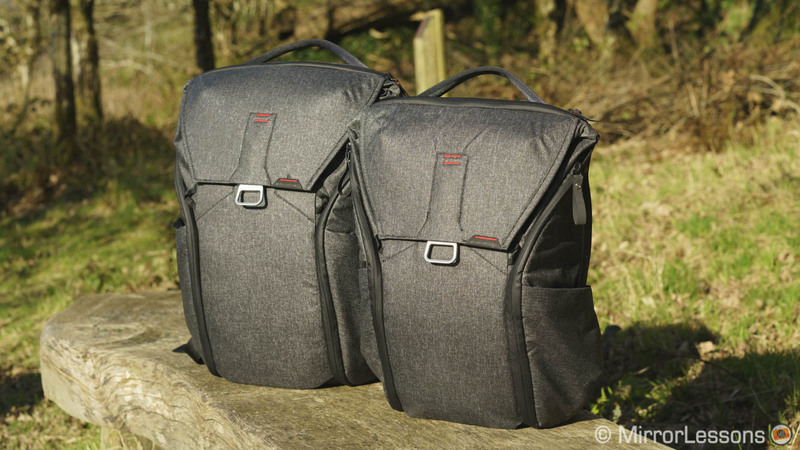 The names of the two versions obviously refer to the total volume each bag can house, which tells us that the 30L has 50% of extra space. Choosing the right size mainly depends on how much gear you want to carry and how big your gear is. The 30L also gives you more versatility for even bigger camera-lens combos. 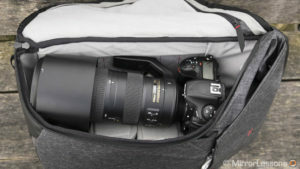 If you fold the dividers to create more space on one side of the bag, you can fit a Nikon D500 with a 200-500mm f/5.6 mounted. Of course the weight will be unevenly distributed which may prove more uncomfortable over a long period of time. On the 20L, the same trick didn’t work for the X-Pro2 and 100-400mm. 20L: an X-T2 with 100-400mm attached can’t fit vertically on one side. 30L: a D500 with Nikkor 200-500mm can! 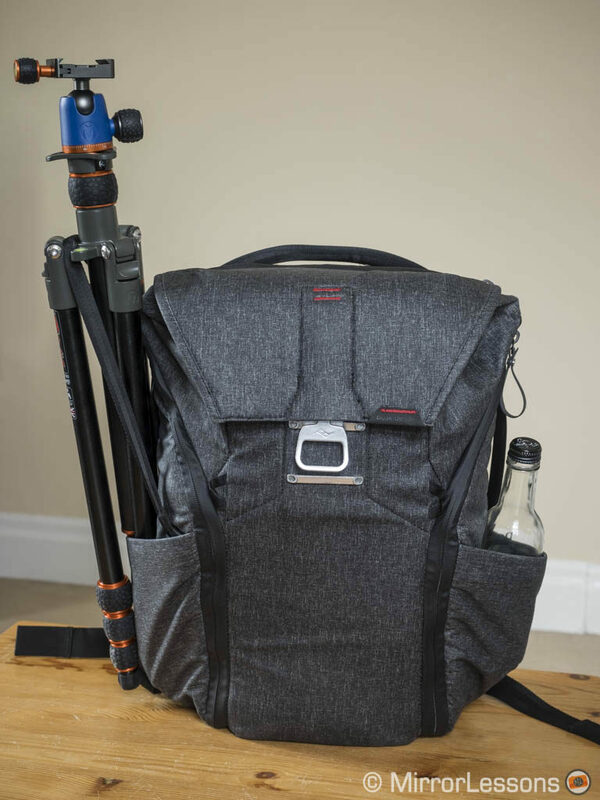 When it comes to gear configuration, the Everyday Backpack is designed to work with horizontal levels via the Flex Fold dividers while the top compartment can be used for cameras as well as other things. 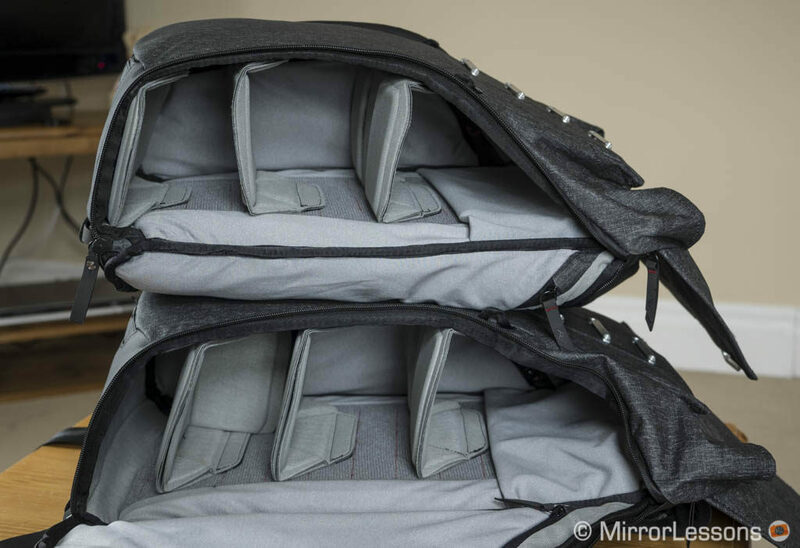 The dividers of the 30L are slightly larger (as expected) and the extra height of the bag gives you more freedom to organise them. 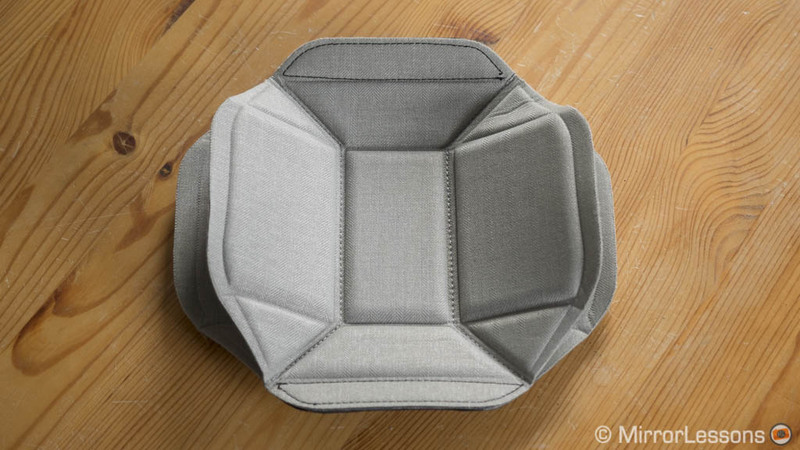 For example if you don’t need too much space on top, you can move the three dividers up slightly on the 30L and create a fourth compartment at the bottom. 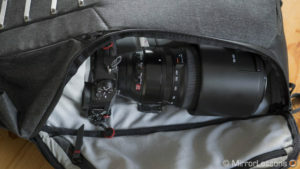 Or you can bring them back down to have more room on top, which could allow you to insert a camera and lens vertically such as an A7r II with 70-200mm GM lens. On the 20L, you have less freedom to play with the space between the dividers. If you need extra room on top, you may need to take one out. 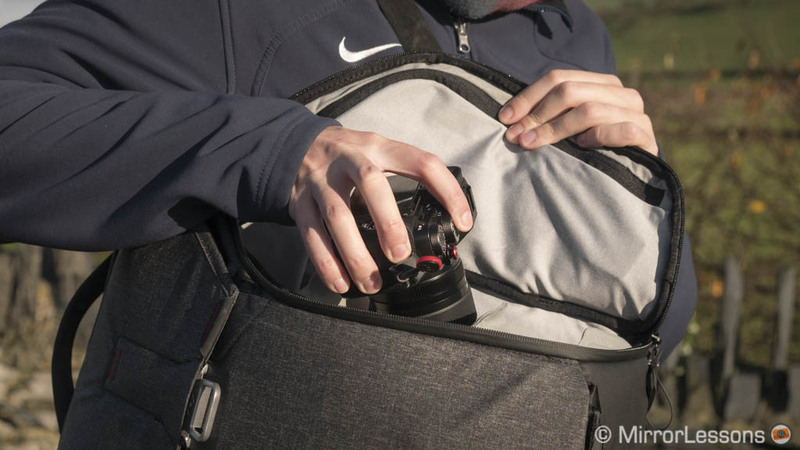 Of course there are multiple configurations depending on your needs and the 20L certainly remains versatile enough. A more radical solution for each bag could be to re-organise the dividers and set them vertically rather than horizontally. 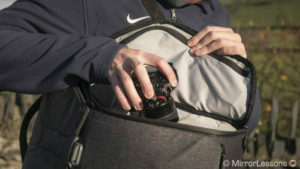 That way you can insert a longer lens from the top and take advantage of the entire height of the bag. However by doing so you lose some of the versatility these dividers can provide when set in their default position. The 30L works better with larger gear, but what about smaller equipment? 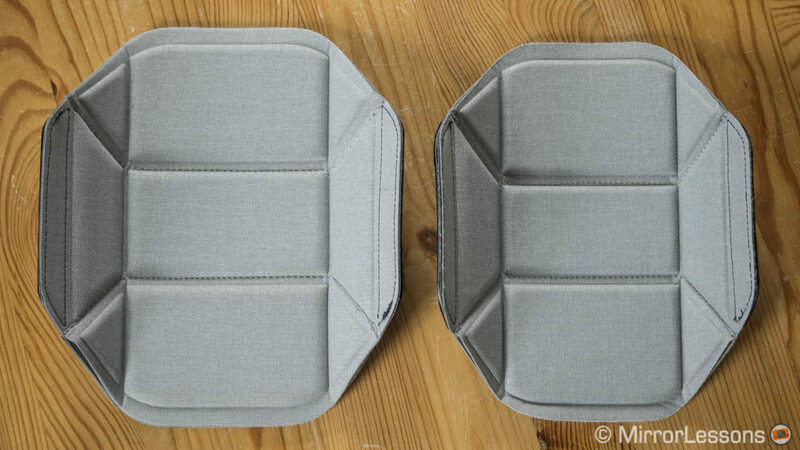 Well, the Flex Fold dividers can still provide space for small items even though they are slightly larger than the ones found on the 20L. 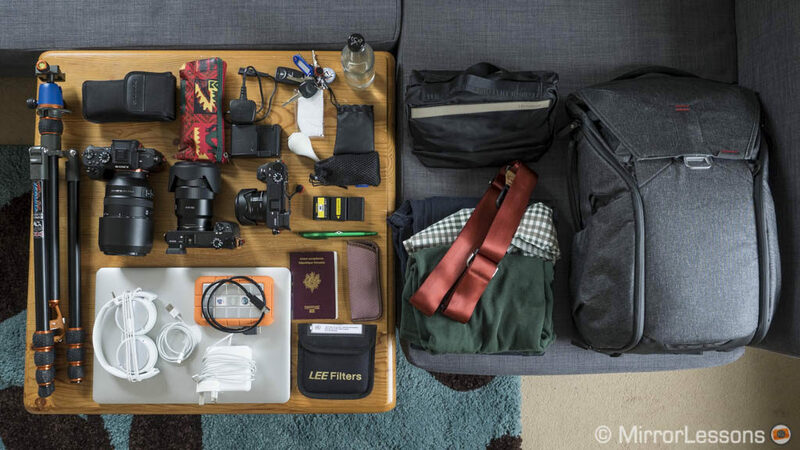 Needless to say, if you only carry one camera and two small lenses, you end up with lots of wasted space on the 30L. Finally we can talk about comfort. The 30L version is only 200g heavier than the 20L so there isn’t a huge difference. Of course because you can pack the 30L with more stuff, the total weight becomes more significant. The two backpacks feature robust shoulder straps with an axial connection that naturally adapts to your shoulders. However the thickness of the straps is the same on both bags and this is perhaps my only real complaint about the 30L. 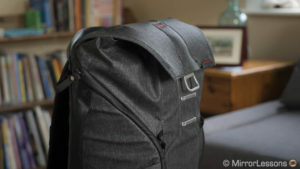 The shoulder straps are comfortable but thinner than those of other backpacks of a similar size. On the 20L I never experienced any problems but after an entire day of walking around with the 30L fully loaded, I started to feel some pain in my shoulders, especially when wearing just a t-shirt. 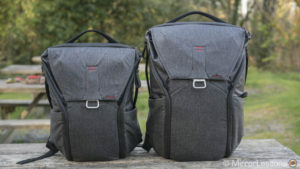 The thickness of the strap is the same on both bags. 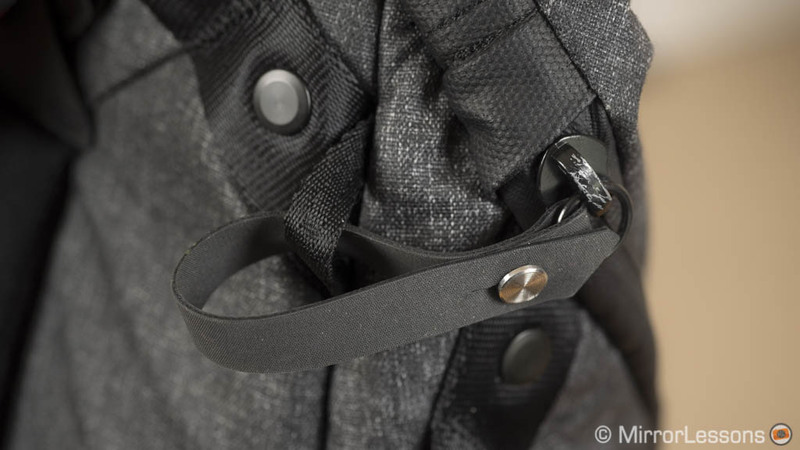 I believe the thickness of the shoulder strap is required to house the Capture Pro clip but that links back to my earlier thought: there should be a separate area on the strap dedicated to the Capture Pro so that the strap itself can be thicker and more comfortable to wear. So now that we’ve seen the main differences regarding what you can fit, let’s look at the gear I was able to pack in each bag. 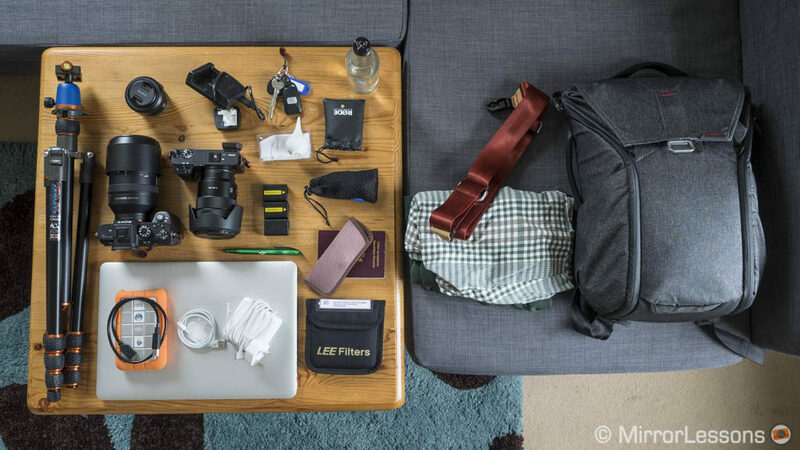 I simulated a two-day trip for which I’d pack photo equipment and personal items. When it comes to robustness, quality, features and versatility, you simply can’t go wrong with the Everyday Backpack. Yes, it is expensive at more than $250, but in my opinion, it is worth the money. 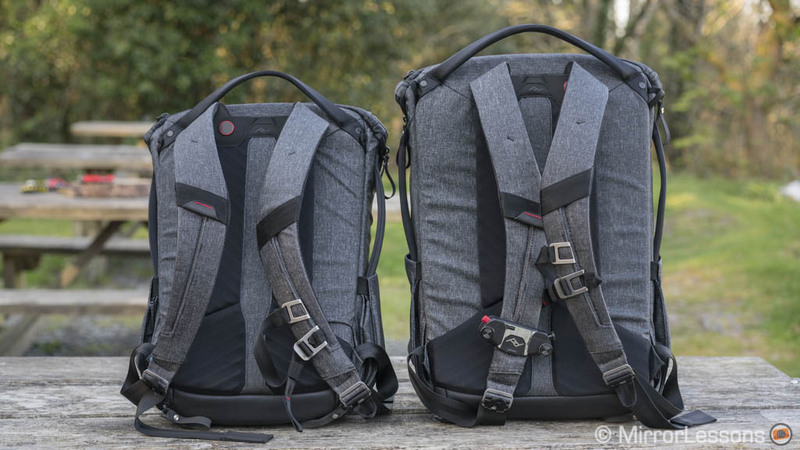 All the features are identical on the two versions so choosing between the 20L and 30L really depends on how much gear you have. If you deal with mirrorless cameras or DSLRs with small to medium size lenses (primes or zooms), the 20L should accommodate your needs just fine. If you use large telephoto lenses, it can vary from system to system as seen above. 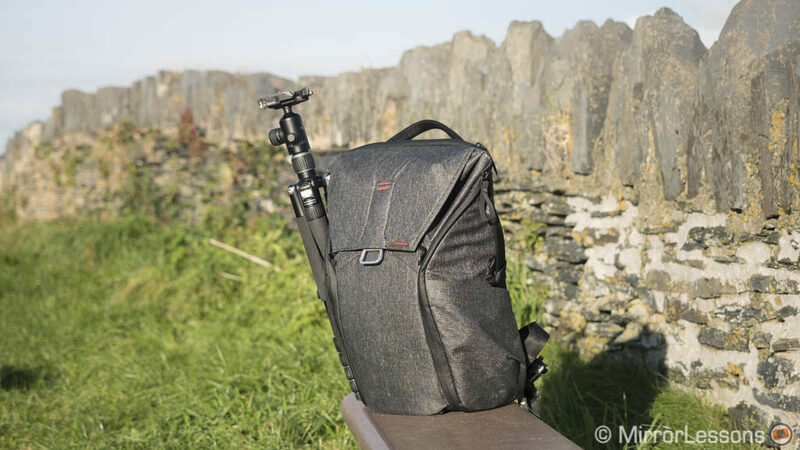 However keep in mind that if you like to pack lots of stuff – from smaller accessories to personal belongings – and take advantage of all the pockets available, the 30L definitely gives you more versatility. When every single pocket is full, everything becomes tight on the 20L. The laptop compartment is a good example of this and getting your computer in and out can become somewhat annoying. The only complaint I have about the 30L concerns the shoulder straps. They could be a little thicker and softer to give you extra comfort when walking around for an entire day with the backpack fully loaded. 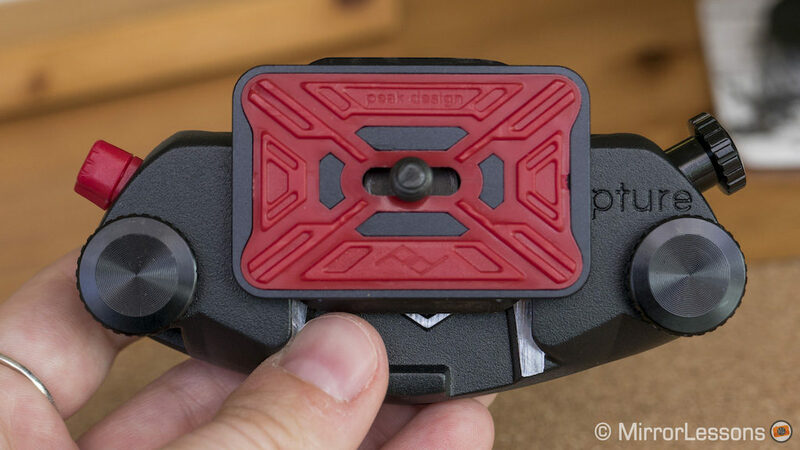 It would also be nice to have a dedicated area for the Capture Pro clip rather than having to squeeze it onto the strap itself.